Writing without thinking? Something I would say I barely do. Or maybe I just cant remember when I do. Either way I will never pass up the option of turning off the brain. It is quite ironic how much societal pressure is placed on developing the conscious brain. The brain that thinks. The mind that analyzes. The person who can solve any problem with intelligence and wit. There is such an importance placed on training, practicing and execution. Working hard and working alone. Coming to terms with this was very uncomfortable for me because I have spent all my life trying so hard to accomplish what is really quite effortless. For all the emphasis placed on trying, who knew the solution was reached by simply not trying. Yet, to get there I still needed to hit the off switch. Turning off the brain. Listening to what is already there. Learning to write, act, speak in a manner of ease and flow. Something I struggle with everyday. Mindless chatter constantly occupying valuable mind space never seems to relenquish its grip. The reign of rambling rompus can often dilute the most deep and discerning moments replacing them with rather dull counterparts, often confused and detached. What is further a problem with the overactive mind is its inability to constructively and adeptly create an outcome resembling anything remotely close to the originally desired goal – this of course being and effortless act of fruition. Inspiration in its purest form is clean and blank. It is immaculately precise and quite simple. By nature it is perfect. However, it is on the path from inception to manifestation that the jumble of the mind can cloud its pristine essence. Therefore, the true challenge to creation is not the idea, but rather the path taken to its manifestation. How is it possible then to nurture inspiration to creation? The first step is breathe. Quite literally I might add. Breathe. Inhale, exhale, repeat. It is actually a bit more than just that. Inhale completely. Through the nose, fill your entire body with the force that supports your life. Inhale until your stomach bursts out and your navel is full. Inhale until you cannot. Then, exhale – all the way. Repeat. Repeat. Repeat. It is as simple as that. Breathe has so much use in our daily lives, that we often seem to overlook its power. It is overlooked so much so that we often breathe incorrectly, in ways that support useless thought patterns. In an accident, trauma victims are often unable to think and act rationally. The first antidote given is to control the breathe. When consciously changed, the mind is able to relax. From the breathe, everything is altered. The way the oxygen entires our blood stream. The manner and quality of its circulation. The chemistry of the mind. And most importantly, the calmness and clarity of thought is experienced. 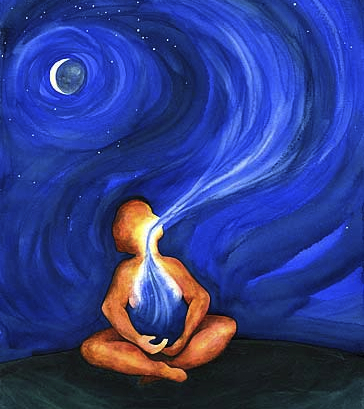 Our breathe is the most crucial aspect of our lives. The only time we stop breathing is when we die. For those in search of peace of mind, it is imperative to consciously create full breathe that extends from the depths of the navel. We breathe every moment of our existence, so to alter its course will change your life. Once the breathe has let the brain settle, the mindless chatter will cease. Then we encounter the second step. Listen. In this silence, all the answers of the universe are within mind’s reach. It is here that inspiration is nurtured into creation. In this place of supreme quietness, an effortless flow takes hold and floating down stream suddenly seems very appealing. All the solutions are manifested with ease and life is extremely enjoyable. Once at the second step, you will realize the only work to be had was done in first. Everyday life is so overactive. The pace of today calls for such a mind. Computers, commutes, work, play, sleep can all overshadow the realm of deep silence needed to manifest desires. Often times I find myself lost between my moments of clarity and instants of insanity. Yet, what always brings me back is the simplest act of breathing. A full and conscious breathe will always align my mind. There is nothing more simple. And with that said: Inhale, exhale, receive.